The purpose of this assessment is to provide the opportunity for you to demonstrate you have achieved learning outcomes for analyze legislative financial system requirements in New Zealand businesses and not for profit organizations and design budgets. Financial plans and proposal for a health safety organization and applied health project or programmed. 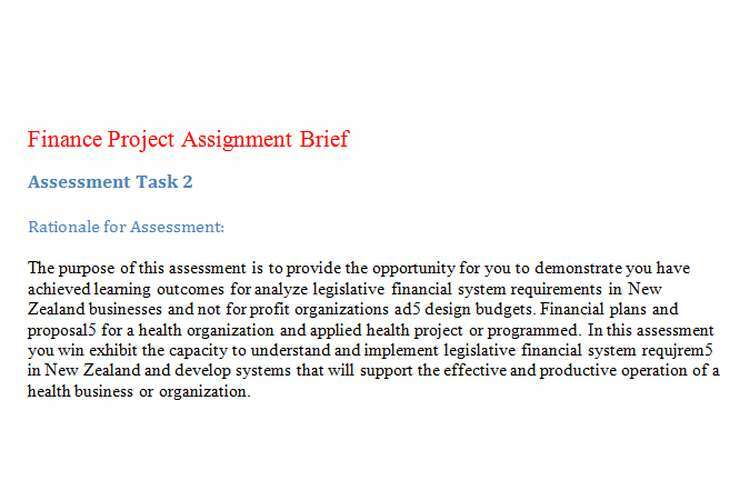 In this assessment you win exhibit the capacity to understand and implement legislative financial system requirement in New Zealand and develop systems that will support the effective and productive operation of a health business or organization. Using your selected or health programmed creates a business plan that will meet or improve the following objectives. Aid the growth of the organization/increase profit) improve sustainability of the organization. Use the following headings to help achieve these objectives. Ensure our portfolio is concise, has relevant diagrams and spread spread sheet for example a spread sheet for budgeting. resent the above assessment task components n a professional manner and include a reference list and appropriate 1egislaton using the APA referencing style.